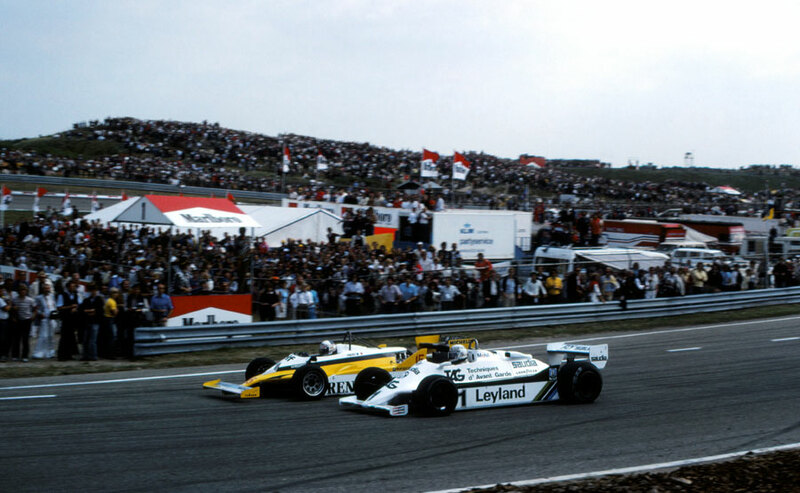 Alain Prost took his second win of the season for Renault, leading the Dutch Grand Prix at Zandvoort for all but a few dozen yards during a fierce battle with Alan Jones. Nelson Piquet's second place put him level with Carlos Reutemann in the drivers' championship. Prost led team-mate Rene Arnoux to the first corner and Jones slotted in behind, his Williams looking more competitive than it had in Austria. Jones hustled Arnoux and moved ahead on lap three, while Jacques Laffite looked for a way by as well. Arnoux dropped back down to seventh before spinning into the sand and stalling. Jones repeatedly attacked Prost but wasn't able to pass thanks to some excellent defensive driving, and although he managed to edge in front, albeit briefly, on laps 23 and 24, he could not drive home his advantage. Jones' hopes ended when his rear tyres started degrading, and he eventually finished in third. There was a spectacular start to the race when several cars nudged each other as the grid headed away, the only serious loser being Gilles Villeneuve whose Ferrari was sent spinning into the sand dunes, although Patrick Tambay's Ligier limped into the pits at the end of the lap. Tambay had hit Didier Pironi, and although the Ferrari continued, he too retired after four laps with damaged steering. Reutemann's race ended when he tried to outbreak Laffite at the Tarzan hairpin and the pair collided. Laffite spun off, while Reutemann limped on a short way before also quitting. Mario Andretti had the most spectacular crash of the afternoon when he suffered a blowout and his Alfa Romeo slammed into a barrier. "I'm mighty glad I got away with just a little damage to my left leg," he said after marshals freed him from the wreckage.